Tis’ the season for sweater weather! One of my favorite times of the year! I’m especially loving the look of the oversized sweater aka grandpa cardigan. You know those cardigans that your grandpa always use to wear with the stripes or plaid pattern on them? Ya, those are totally back in style. I usually love styling them with some high waisted denim, a simple tee and some ankle booties. Since I’m now styling my bump, I’ve found that wearing an oversized cardigan over a simple t-shirt dress or bodycon dress with boots is just as cute. I’m not sure if you guys remember, but during the Nordstrom Anniversary Sale, Topshop came out with some REALLY cute oversized cardigans….and then they sold out in one hour…..and never restocked. Devastating I know. BUT I was so happy to basically find this identical one by Goodnight Macaroon last month! Almost the exact same beige color with similar black and white stripe detailing. Score! I found this gorgeous designer dupe cross body bag while shopping in New York during fashion week and still can’t get over that it’s under $50! 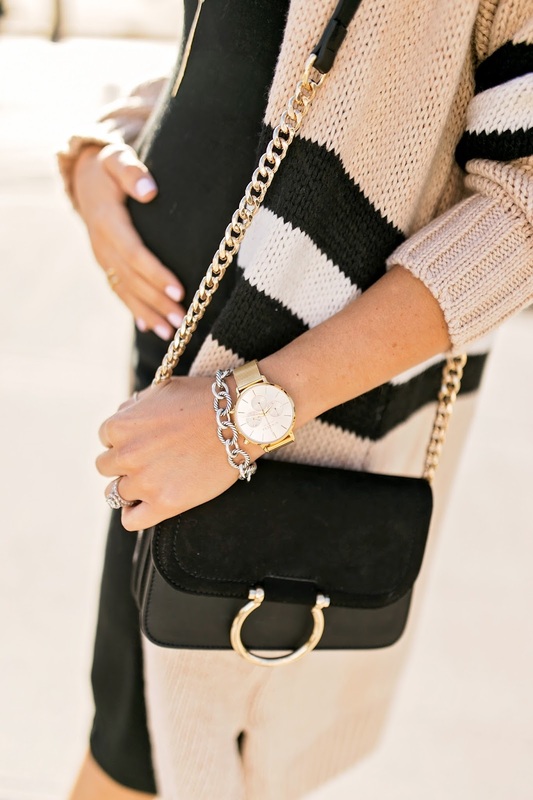 Feels luxurious and I love the chicness of the gold details. I’ve been collaborating with Vincera Collective for over a year now and still continue to LOVE their watches. Classic, well-made, and the perfect sized face. I tend to wear bigger faced watches as I love the look paired with a pretty arm party. If I had to pick my favorite styles for fall I would go with the rose + white Eros Mesh, the gold + black Eros Mesh and the gold + silver Kleio Mesh. All great picks for the season! (You can get 10% off your order site wide with code “ashleydonielle”). Now if only the weather would stop switching from fall to summer and back again! Next Post Shopbop Sale – Last Day!